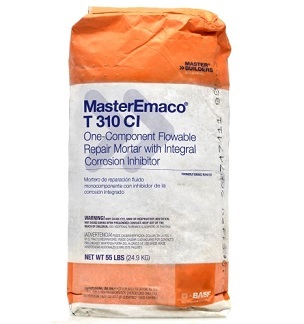 MasterEmaco T 310CI (formerly Emaco R310 CI) , Concrete Surface Repair / Patching Mortar. A polymer modified mortar with corrision inhibitors. Patches / Resurfaces Distressed Horizontal Surfaces and Small Spall Repairs. 55 Lb/Bag. Price/Bag. Shipping Leadtime: 1-3 weeks for small order. MasterEmaco T 310 CI repair mortar is a polymer-modified cement-based mortar with an integral corrosion inhibitor. It is used for patching or resurfacing distressed or spalled horizontal concrete surfaces. MasterEmaco R 310CI repair mortar is designed for both interior and exterior use. It can be applied from 1/4 to 1" thick as mixed, and thicker if pea gravel is added (see Product Data Sheet). One bag yields about .43 Cubic Feet. Resurfacing rough floors and work areas. Use inside or outside.